Every now and then when a month ends, I like to quickly reflect on it. These posts typically come just twice a year and usually cover March or December and a summer month. I have never focused on September before. However, there is a first time for everything. September 2015 was great from both angles. When I say “both angles” I mean work life and personal life. Even busier this September than last, I have had my hands full on the campus at Coastal Carolina University. The month couldn’t have started off with a bigger bang. On Wednesday, September 1, we announced that our institution would join the Sun Belt Conference. It was a historic announcement that made for a busy and fun day. Speaking of sports, our football team made its debut on the brand new teal turf. I was there to cover that first game as everything that went out socially that night seemed to turn to gold. I was then back on the #SurfTurf the following week for the second home game. Yes, football season entails that we all work weekends and many times don’t leave the office until late at night but I wouldn’t trade it. Lucky for me, the four game football home stand will continue for the first two Saturdays in October. 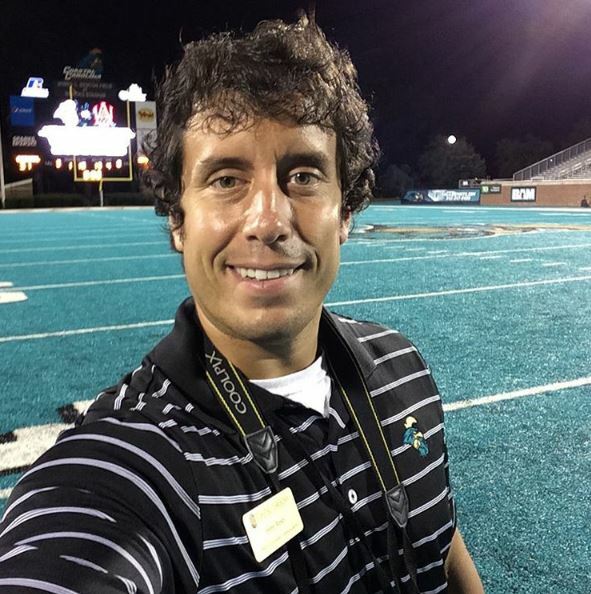 Me standing in Brooks Stadium on our teal turf after the September 26 game. Moving to the Sun Belt and the first game played on this field with the new turf brought a lot of excitement in September to TealNation. With September being the first full month of the academic year, things were just busy in general. I got to fully implement the numerous social media campaigns I created for the year and evaluate their performance. I presented to a couple departments on campus, worked with several student groups, met with my CINO Legacy Mentee twice, and visited several different classrooms where I had the opportunity to capture learning in action. I staged the #CCU Periscope Marathon, an exhausting day where we broadcasted live for nine hours straight. I received recognition from a couple publications, including the student newspaper. But the crowning achievement for the month of September was no doubt the establishment and inaugural meeting of the #CCUSocialMedia Student Advisory Group. This was a long time coming and one of my original goals so to see it come to fruition was the professional highlight of the month for me. No questions asked, meeting with my #CCUSocialMedia Student Advisory Group was my favorite professional part of the month. The overall highlight of the month for me, however, was having my brother come and visit me. As I mentioned in a blog post recapping Glen’s vacation here in Myrtle Beach, it can only be described as epic. Sidney and I had such an enjoyable time showing him around the area and just being able to have fun. It will be something that we will always talk about for a very long time. 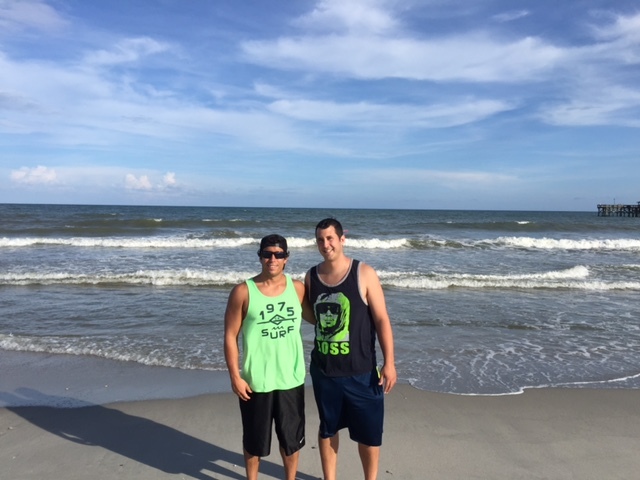 Nothing was better this month than having my brother visit me in Myrtle Beach. September was also the month where I finally learned how to formally play golf. Sidney and I completed our fourth lesson last night and have really gotten a lot out of them. Living in Myrtle Beach, it was definitely time that I actually learned how to play. I also watched as my new favorite show came to a conclusion. It was an intense month of “Big Brother 17,” an emotional roller coaster as my two favorites (Vanessa and Austin) both had their ups and downs. Unfortunately it culminated with a major disappointment as Steve won. Of course I will always have the lasting images of Pope Francis making his visit to the United States. Watching him make the tour through Washington D.C., New York, and Philadelphia was special. The way he conducted himself and the way the American people and media embraced him will always be cemented in my brain. Tomorrow, October will begin. It is the month of my birthday and Halloween so it can’t be that bad. If I missed you in September, I hope to see you in October. Don’t Blink. One of the more popular apps out right now is Timehop. The service pulls information from your social media channels and phone to give you a snapshot into what you were doing on that date various amounts of years ago. For example, if I open up Timehop right now I would be shown the tweets and Instagram images I posted for the date of September 29 through the years. It would also pull the images I took with my phone on that date as well. It is kind of like Throwback Thursday every day. 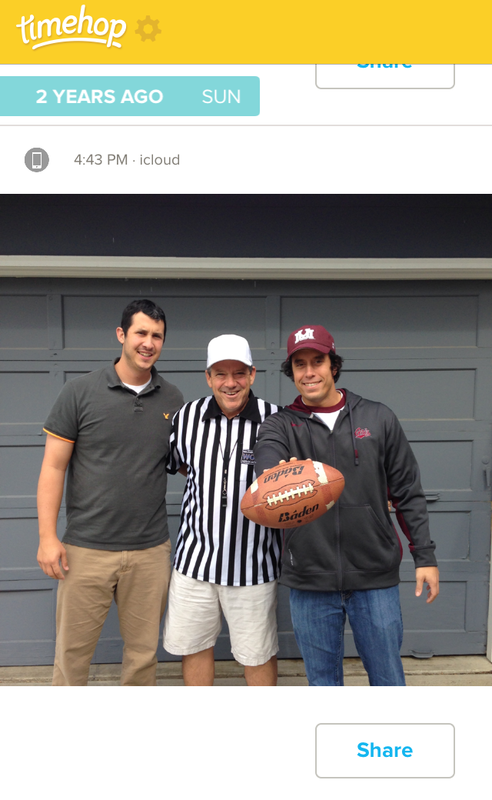 Timehop let me remember this fond memory two years ago with my dad and brother. It took me some time to warm up to Timehop. I take great pride in keeping a very descriptive journal so I can remember what happened five years ago. How dare an app come on the scene and try to do it for me electronically. Also, what about the millions of people that use Timehop? They never journaled a single day in their lives. Why should they now get the privilege of seeing what they did seven years ago? But of course the more I thought about it, the more I realized how ridiculous I was being. Timehop and my journals chronicle way different aspects of my past. 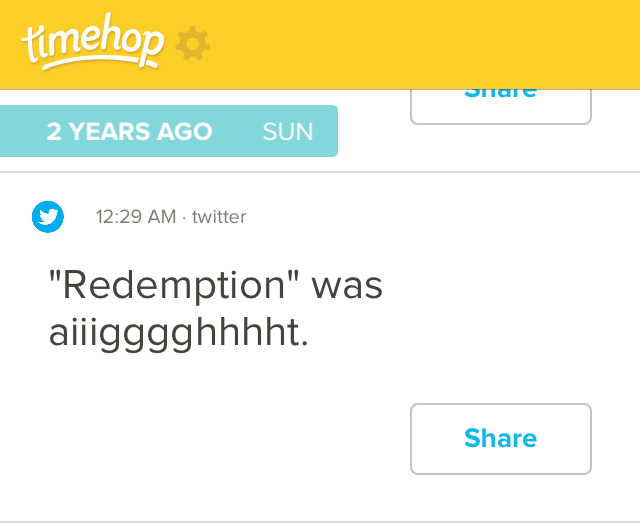 Timehop does a good job at summing up the big picture and displaying one’s social media habits at the time. My journals on the other hand are all about details, stuff that even my obsessive tweeting self would never post. Even with that cleared up, I still think the app seems a little too cheap. I wish the information was presented in a more interactive and fun way. I believe that at this point a color change and visual makeover is due. The app is not always 100% accurate either. But I admit, over the months it has grown on me. I check Timehop on a daily basis for three main reasons. First, I get a kick out of seeing how dumb I was on social media. It is kind of like listening to your voice on an answering machine or seeing yourself on video. At the time you thought you sounded and looked decent but when listening or watching it in the future you are disgusted with yourself. When I am faced with the tweets I sent back in the day (including just a year ago) I cringe. Many of them are pointless, silly, and a little immature. Second, it can be a great content gathering idea. I have used Timehop as inspiration for a couple of past blog posts (including this one). I use it to generate creative sparks while at work too. As all the photos I took a year ago while at Coastal show up on a daily basis I can take the good ideas I had and build off of those. It also gives me a friendly reminder on what I have done before so I never completely duplicate anything. Obviously the service also gives you the luxury of sharing your old social media activity on your current platforms. Timehop can be an excellent content idea generator. 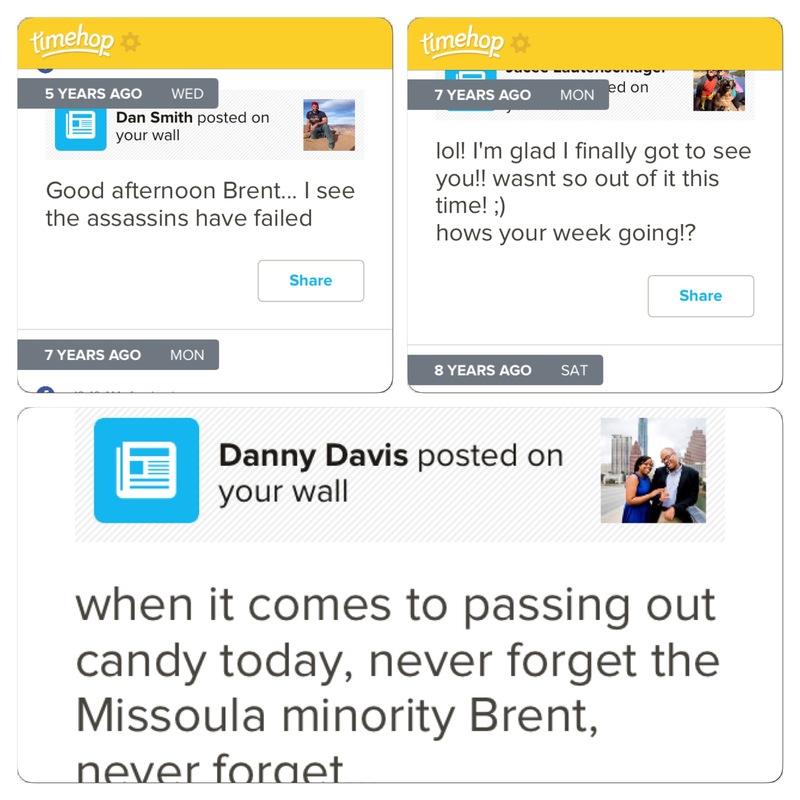 Lastly, I use Timehop to view the old Facebook posts that people left on my wall 7-8 years ago. Most of the time it is pure comedy. We as a society don’t communicate the same way on Facebook now as we did almost a decade ago. As texting was not as widespread and constant back then, I notice that many people wrote on my Facebook wall to legitimately make plans. Other people just shared random thoughts. I never know who is going to show up either. I have had to literally think long and hard about who certain people were who wrote on my wall simply because it was so long ago and sometimes names have changed. Nothing like seeing old Facebook comments from 5, 7, and 8 years ago! Brings me down Memory Lane. Timehop isn’t the best app but it isn’t a terrible app. It is also free and very easy to use. If you like to “go retro” occasionally and don’t mind being reminded of how lame you once were on social media, give it a download. Don’t Blink. Last night I was not fortunate enough to see the blood moon. The cloudy Myrtle Beach skies didn’t make it possible. Not that it hurt my feelings too much, for whatever reason I have never gotten that excited about astronomical rarities. Does that mean if I was able to see it that I wouldn’t have taken a photo and posted it to Instagram? Definitely not. This rare occurrence combined with the “blood” color of the moon combined with loose interpretations of religious texts brought out the doomsday sayers. Groups of people prepared for the absolute worst as they stockpiled endless supplies of bottled watered, purchased countless cases of canned food, invested in the best safety equipment on the market, and constructed bunkers/hideouts/safe houses. As with the other hundred end of the world scenarios that grabbed media attention since I have lived on this planet, the catastrophe never came to fruition. Now I am not hear to mock the folks who went all-in with Y2K or spent their life savings preparing for the aftermath of 12/21/12. I realize that some of these folks are brainwashed by influential people, or, despite best intentions, just interpret prophecies wrongly themselves. These people want to protect their families and honor their faiths. Again, I am not making fun of these men and women. However, I would love to watch a documentary done on how these people reacted when the end of the world never materialized. At what point on December 21 did they realize that the world wasn’t ending? When last night did people fearing the blood moon come out of their fortresses? How exactly did they come to terms with the fact that disaster never did strike? I would like a couple more questions answered as well. How did they deal with the humiliation? What did they do with your excess amounts of bottled water and baked beans? How did they explain everything to their children? How did they get on with their lives in a healthy manner? Again, these aren’t facetious questions. Rather, these inquiries would start dialogue that I think would be extremely fascinating. The documentary would focus on a family from each of the different end of the world prophecies over the past few decades that prepared for the worst. This would give the film great variety while at the same time identifying common themes both pre/post fake apocalypse dates. Of course, I have an idea to take this all one step further. Again, I am not trying to make a sham out of these people but I think my thought has potential. Why not take one member from each of the most notorious families who prepared for the end of the world (I am thinking the ones who made national news) and have them compete on a reality show? You could devote a whole season of “Survivor” to this unique group of people or just make up an entirely new show. How would these folks who did all they possibly could to survive the end of the world actually do in a simulated type situation? I think it would be gripping television. Ratings would be huge. Perhaps Donald Trump could compete as a wild card contestant. I am sincerely interested in the people who erroneously doubled down on a specific date they thought the world would end. I would like to know more about them and even see how they would have fared had their predictions proved correct. But remember, we will never know the time nor the date when the world will end. Don’t Blink. I love Halloween. I enjoy trick-or-treaters, scary movies, and pumpkin flavored food. However, I enjoy two other October 31-related activities even more. First, I love attending haunted houses. I like getting scared, jumped out at, and chased. Secondly, I love dressing up! I spend way too much money going to Spirit and purchasing a costume while also adding on several unnecessary props. Great fun for me. 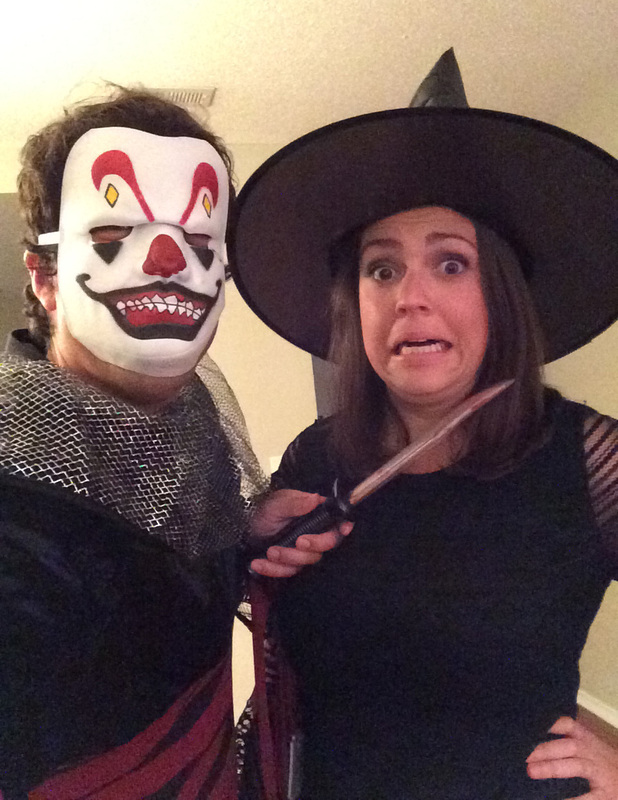 But, believe it or not, there is something about haunted houses and dressing up that I enjoy that doesn’t directly relate to the theme of Halloween. Okay, here it goes. Halloween is seasonal. Because of that, haunted house attractions and costume shops such as Spirit aren’t open year-round. Instead, haunted houses are usually in commission for only a month while Spirit stores might operate for three months. With these short spans, they must rent space in shuttered stores. Most haunted houses and Spirit locations are in old supermarkets, supplies stores, and random strip mall locations. Old out of business stores that shut their doors are brought out of retirement so they can be converted into a temporary maze of screams or a space for folks to spend around $60-$100 on the season’s hottest Halloween costumes. I sometimes think of it as a professional athlete who retires only to come back a couple years later with a new team and diminished skills. This intrigues me though. For me, there is just something kind of cool and mysterious about a long shuttered grocery store having its locks removed and given a second life. In my head I immediately start to think about how the haunted house crew or the Spirit managers will use the space for something completely different. I lived in Spokane long enough to visit businesses for years only to see them go out of business and then be reincarnated as a haunted house or a Spirit store. It is kind of a weird feeling because you have memories of the prior tenant and what it used to be. You thought the day would never come when the doors would be opened again. Finally it happens but the reason it does is for a temporary and gimmicky cause. The old store is not going to look nice. It is going to be cold and rugged. It is going to look exactly like someone is camping out there just for a short duration of time (no surprise). It is going to be a shell of its former self. However, when you walk in memories will still surface. But even if I don’t have history with what a certain building was before a haunted house or Spirit took over I still find myself interested. Especially with Spirit stores, I look past the costumes and temporary lipstick and try to envision where everything was placed when the brick and mortar actually had a tenant that planned to be there for the long haul. With haunted houses you are usually disillusioned as you go through the maze but the thought always goes through my head…people used to walk on these floors to buy milk and bread, now I am scurrying across them at midnight to satisfy my need to be scared. Does this interest anyone else? Or is just another one of my weird quirks? I also get really excited about old movie theaters that are repurposed into other businesses but that is for another day. When you visit your local Spirit next month be mindful of the history of the building it inhabits. Don’t Blink. Papal Visit – I can’t get enough of the Pope Francis coverage. It is so comforting to know that I am in the same country as him right now. The example that he sets is just so inspiring and incredible. Even by watching him on television I feel a certain type of way. I don’t think anything is more special than when the pope greets someone and the reaction that follows. Some just break into tears, some go weak, some seem to glow. The message he has been preaching since he arrived in the United States a couple days ago is spot on. I pray that his historic trip to our country continues to go peacefully and smoothly. Weeknight Ice Cream – Sidney and I don’t normally go out for ice cream during the week but when we do, we make sure it is the best place in Myrtle Beach. On Tuesday after we returned from the driving range at a local golf course we stopped at a colorful and eccentric ice cream shop on the side of the road. Technically in the area called Garden City, we pulled up to Meyer’s Ice Cream Parlor. It was a complete 1950s throwback with walls painted different colors, big cushiony black booths, and decorations/collectibles everywhere. 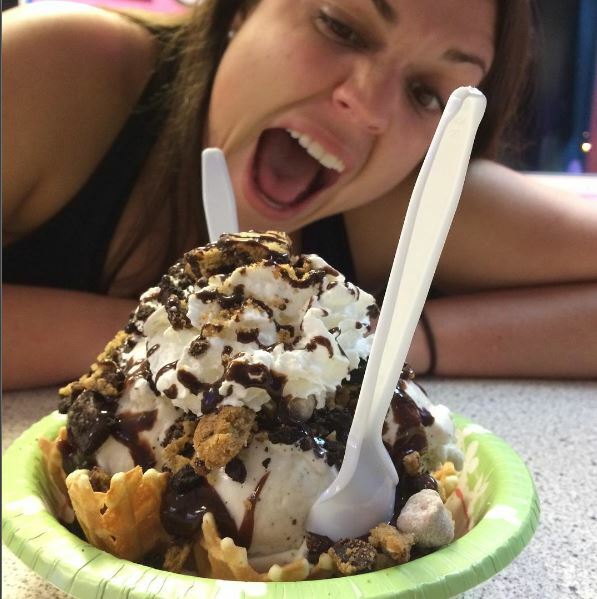 We split the cookie lovers sundae and I still can’t think of words to do it justice. It was two scoops of cookie dough ice cream in a homemade waffle bowl topped with oreos, crushed chocolate chip cookies, and additional cookie dough pieces. It was drizzled in hot fudge and spayed liberally with whipped cream. At the top was an intact cookie. No questions asked, it was one of the best desserts I have ever tried. This was the amazingly good and large sundae we enjoyed at Meyer’s Ice Cream Parlor. “Big Brother 17” Reaction – Watching Steve win the final Head of Household competition over Vanessa stung a little bit. He made it no secret that he planned to evict Vanessa and take his chances with the jury against much weaker Liz. Although I never cared too much for Steve it was a no-brainer that he would be crowned the “Big Brother 17” champ over the twin. I just wanted Vanessa to win so bad. She played a masterpiece of a game but came up just short. #CCU Periscope Marathon Reminder – Just a quick refresher that tomorrow Coastal Carolina will hold its #CCU Periscope Marathon. We will be broadcasting for nine hours straight. I encourage you to watch some of the action by downloading the app and following us at @CCUchanticleers. No other university has ever done something like this before. 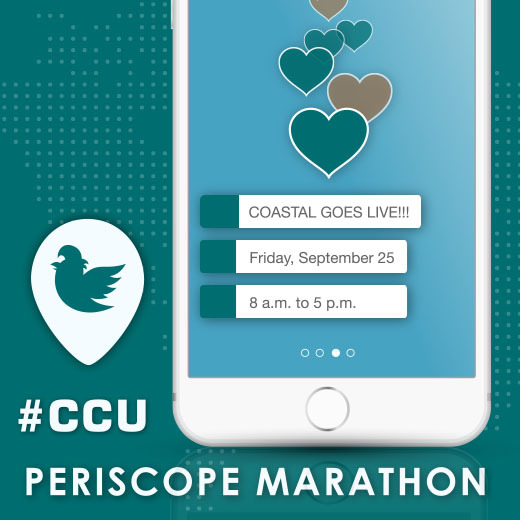 Our #CCU Periscope Marathon is a first of its kind. 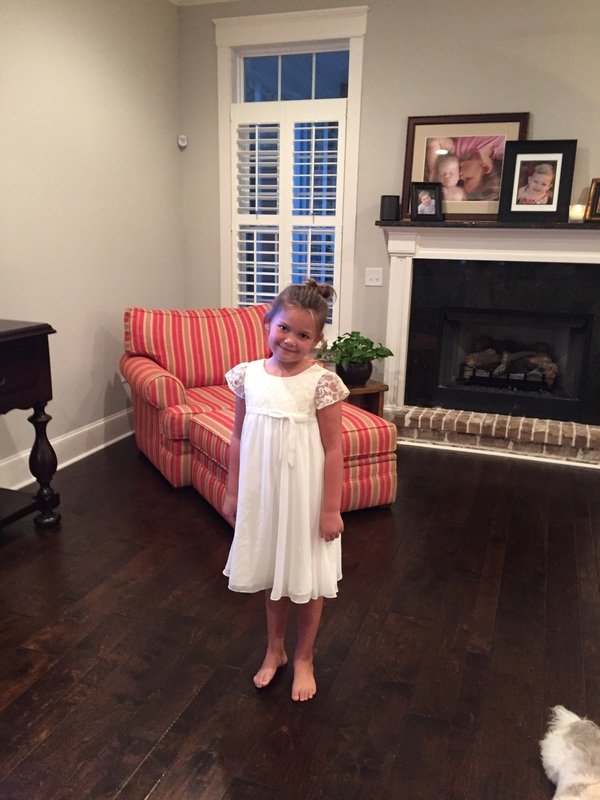 Wedding Update #9 – Our beautiful flower girl, Russell, now has her dress! Also, our Pre-Cana classes start October 13. In case you are wondering, just 261 days remain until our big day! Look how pretty she looks in that dress! End your week on a strong note tomorrow! Or, if you will be working through the weekend like me, finish strong every day. Thank you for your readership, I genuinely appreciate it. Don’t Blink. On a Wednesday evening early in the summer I was bummed. Sidney and I were to leave for Spokane to enjoy vacation with my family. However, Delta Airlines called me right as we were about to leave for the airport to tell me our flight was canceled. With our trip now on hiatus at least for the night, we tried to make the best of the situation. We went and picked up Chinese food and returned to my place to eat and watch television. Sidney had the remote and changed the channel from ESPN to CBS. If there was a silver lining in our whole mess with Delta, it was that Sidney could now watch her favorite summer program. It was the “Big Brother 17” season premiere. On a typical day I would have protested. I am not a fan of most reality television and at the time I considered the Big Brother franchise the scum of the genre. How boring, uncreative, and trashy can you get? People are confined to a house for three months while cameras follow their mundane activities and random conversations. No thank you. I watched that first episode with Sidney from start to end. I made fun of it the entire time. I wasn’t really even paying attention to the content of the show, I was just expressing how dumb I thought the people and concept were. Sidney told me that she didn’t want me to watch it with her anymore. We went to Spokane and for roughly the 12 days we were there, she kept up with the show. I didn’t. When we returned to Myrtle Beach and she started watching it on the scheduled nights again, I told her I wanted to watch it with more of an open mind. She gave me a second chance. Those first few episodes I was still very cynical. I tried to be on my best behavior but my sarcasm sometimes came out and Sid became frustrated with me. However, after those initial episodes, I started to chill out a little bit. My interest was piqued. My insults turned to questions. I asked Sidney question after question about game strategy. I inquired about Power of Veto competitions, double evictions, Zingbot, and Julie Chen. I learned about the tradition of the show and common tactics. I actually learned the names of the cast and the weekly format of the show. Although I wasn’t necessarily a fan of the program yet, I was at least becoming educated. As the weeks went on I actually started to kind of look forward to Sunday, Wednesday, and Thursday evenings in front of the TV. I started to understand the competition. Perhaps most importantly to my Big Brother initiation, I began to root for certain houseguests. I also zeroed in on a few houseguests who I absolutely detested and wanted to see evicted. A subtle passion was developing inside of me. By late August I was very involved with the show. Sidney and I planned our evenings around the program and discussed it during our free time. I was talking “Big Brother” with people at work. At times I would watch the expanded “Big Brother After Dark” programming. In a couple true moments of weakness, I turned to blogging sites for spoilers. Sidney had converted me into a true “Big Brother” fan. Throughout the season I strongly supported Jackie, Austin, and Vanessa. Jackie appealed to me much to my fiance’s chagrin. Austin was just a likeable and eccentric guy. Vanessa had been on my radar since her poker playing days and I respected her intelligence and strategy. Unfortunately, not all three made it to the end. Jackie earned herself a spot on jury but was evicted weeks ago. Austin was stunned early last week when he was evicted by an unlikely houseguest. Who was that houseguest, you ask? It is the person I am 100% rooting for tonight…Vanessa! Like I mentioned, I am in awe of how smart and calculating Vanessa is. She has been my favorite the whole show and I want to see her win that half million. I know she faces a tough road this evening but her back has been up against the wall several times this summer. I really hope she makes the final two and that the jury makes the right decision to crown her the champ. Sidney, you were right…”Big Brother” isn’t that bad. I have enjoyed watching the show this summer and I appreciate you putting up with me! Will I watch next summer? Tough question. These shows bring with them a significant time investment. I might watch, I might not. However, I won’t knock it. Enjoy the finale, everyone. Don’t Blink. Today was very exciting for me. One of my goals when I arrived at Coastal Carolina University was to establish a student group focused on social media. Right before the start of this academic year, I received approval to form the #CCUSocialMedia Student Advisory Group. I had students apply by writing an essay on why they wanted to take part in it. After I had selected the members I worked with everyone to find a day of the week and time that would work for all (not an easy task when you are working with busy college students). Almost 16 months since I arrived at this university, we held our inaugural meeting at noon today. The goals of the #CCUSocialMedia Student Advisory Group are to take the members behind the scenes of what I do, paint an accurate picture of the social media industry, diligently listen to/act on all feedback they provide regarding our social media program, and provide them with opportunities to gain experience. Today we pretty much did that all. After playing social media trivia I presented to the group and told them about what I do. I also scraped the surface of the job outlook for social media positions. We then engaged in a great conversation that dealt with the strengths and weaknesses of our social media program. 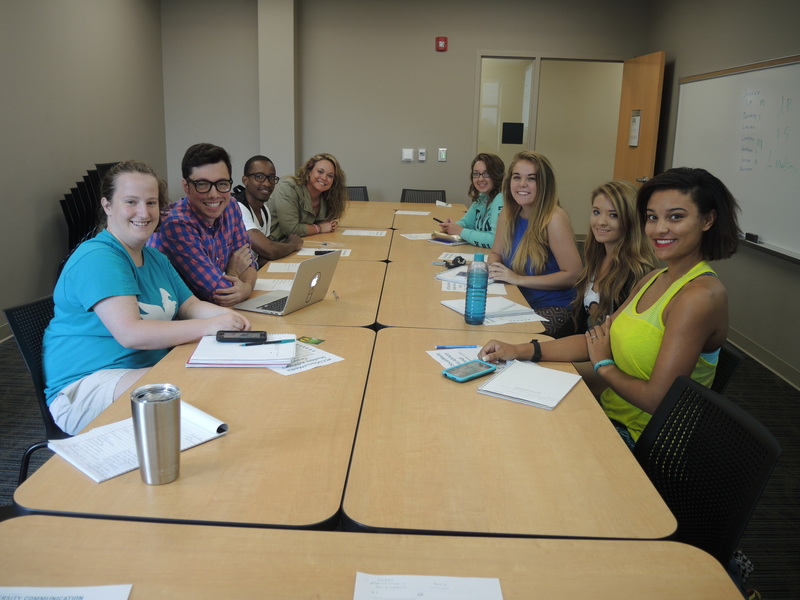 I was very happy that I got to meet with our #CCUSocialMedia Student Advisory Group today. This has been 16 months in the making. But what about the “experience opportunities” part? Oh, they got that too. About 30 minutes before making the announcement to the general public, I revealed the next big #CCUSocialMedia event to this special group of students. 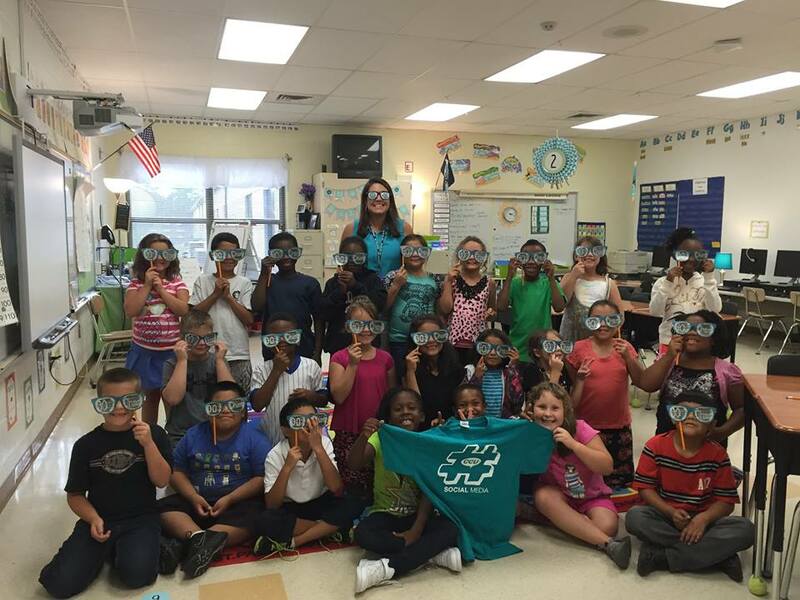 I enthusiastically told them that this Friday we would host the #CCU Periscope Marathon. Going from 8 a.m. to 5 p.m. on September 25, our Periscope channel (@ccuchanticleers) will broadcast live for nine straight hours. The best part about the #CCU Periscope Marathon isn’t that it will provide our audience with 540 straight minutes of our beautiful campus. It isn’t that it will educate the masses about the magic of Periscope. It isn’t that no college in the country has never come close to doing something like this. 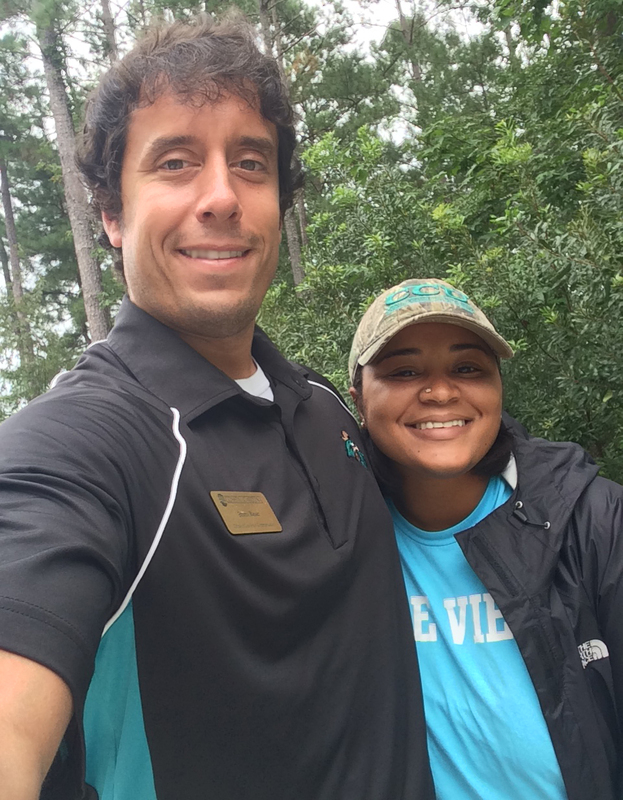 Rather, the best part about the #CCU Periscope Marathon is that it will be largely driven by students. Yep, I am depending on the #CCUSocialMedia Student Advisory Group to provide most of the content and facilitate the majority of the Periscope broadcasts come Friday. At today’s meeting I flashed a slide that broke down 30 minute shifts for the students to claim. Upon volunteering for a half hour block and signing a contract, it will be all them during that specified time on Friday. Although I have improved my less-than-stellar Periscope narrating skills, our Periscope audience will be so overjoyed to have the fresh voices of college students guiding them through the marathon. I hope you will tune into our Periscope channel (@ccuchanticleers) on Friday. The allure of watching an original and challenging social media event play out will entice many but the real draw will be the students. Don’t miss out on the fun. Don’t Blink. 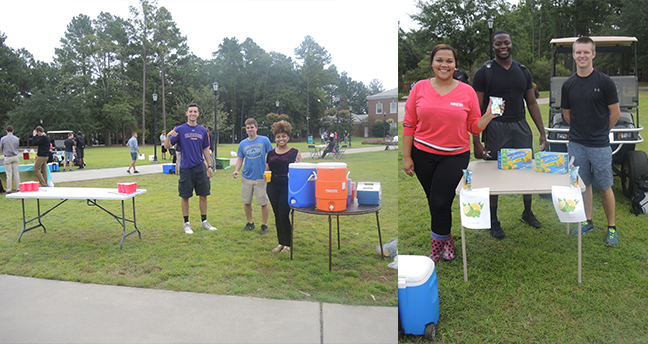 Last week I reminisced about some of my Kool-Aid stand memories to set up a great event that was held at Coastal Carolina University. 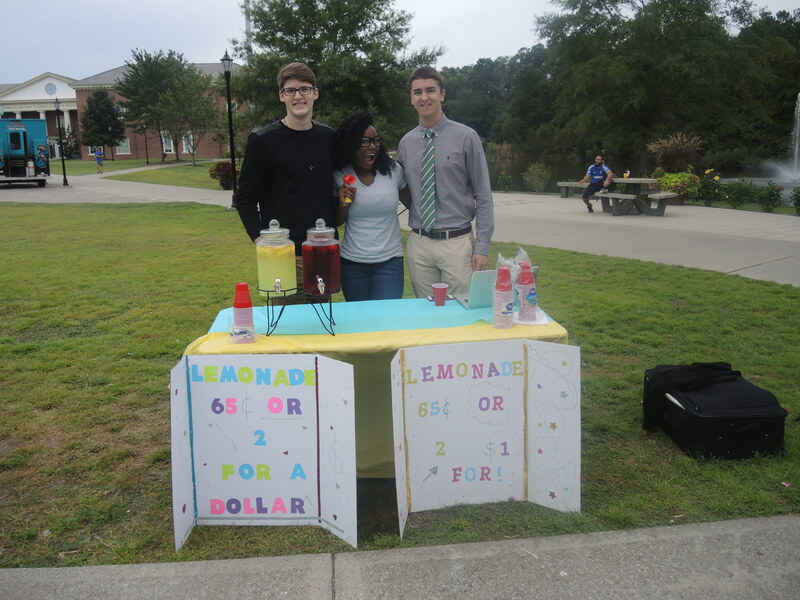 Students in a Management 309 class formed teams to participate in a lemonade stand competition. 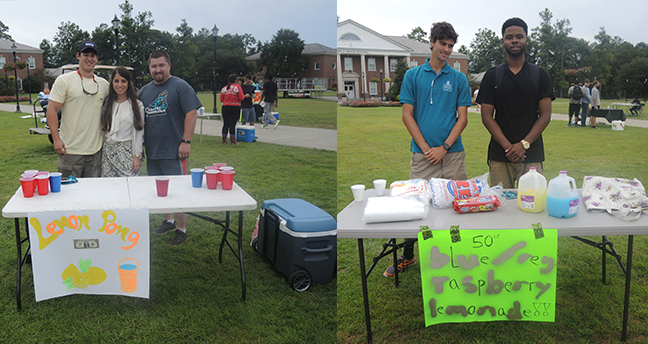 During the morning of September 15, these teams took over Prince Lawn with numerous lemonade stands, competing to see who could generate the most revenue. As I wrote in that day’s blog post, the tactics used were very creative. Two days later a different Management 309 class set up shop on Prince Lawn and did what they could to raise the most money. 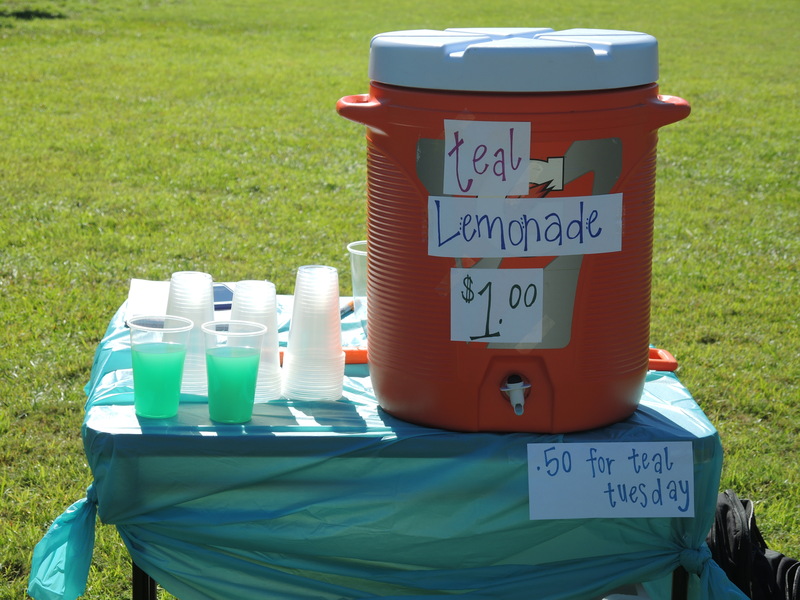 Perhaps inspired by the class that went before them, Thursday’s crop of lemonade stands displayed even more creative revenue generating recipes and schemes. As I did last Tuesday, I thought I would shine the spotlight on these most recent summertime drink entrepreneurs. The first stand I approached opted to go for the “mobile strategy.” The student working the stand told me that she was alone because her two other group members were out trying to recruit customers to visit their stand. However, this team was trying to attract a different type of audience. Instead of hassling students to stop by, the young marketers went right to staff and faculty members! I don’t know if our professional CCU employees responded well or not to the tactic but I definitely thought it was a great idea. 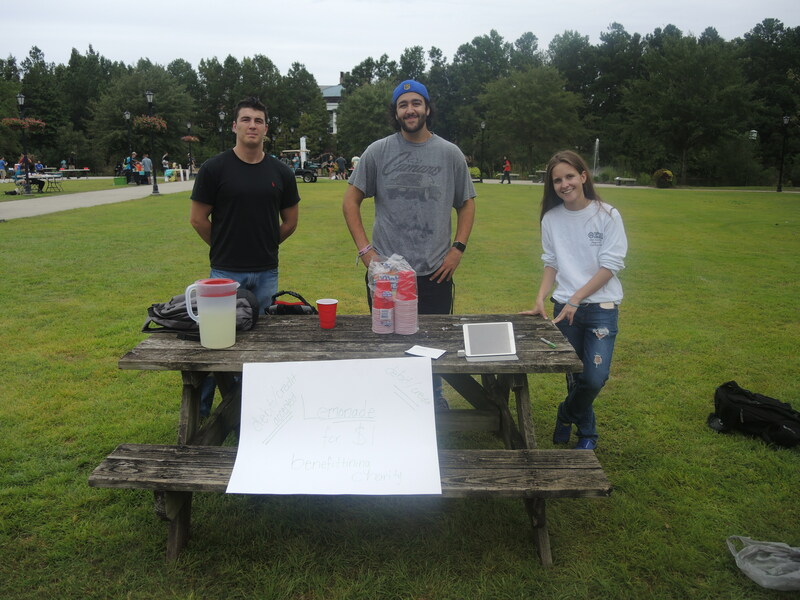 The team also “sweetened” their stand by providing homemade lemonade. This student is at her lemonade stand solo because her group members are out and about convincing staff and faculty members to come purchase their drink. Still fresh on my tour, I went to the next stand that definitely stood out. These particular students configured their stand to accept credit and debit cards! How cool. They explained to me that most students don’t really carry cash around campus and having the option to just swipe their card for a glass of lemonade is a convenience that would be enjoyed by all. Their stand itself might not have the best presentation but it doesn’t matter because they accept credit and debit cards. The original ideas kept coming. The next stand I visited offered cold bottled water with your choice of various lemonade flavor packets to choose from. You could mix your own lemonade drink, knowing exactly that the chief component of the concoction (the water of course) was fresh and pure. The team across from this group went with a much different approach. 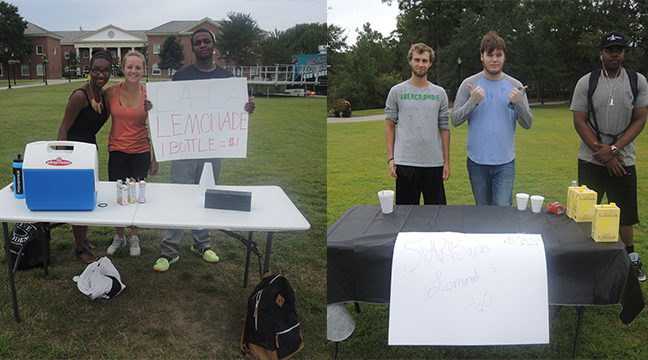 They were offering Starbucks lemonade, the only premium brand name drink available on Prince Lawn they assured me. Better yet, the group was selling the drink for a 1/3 of the price that Starbucks commands for it. The group on the left had bottled water in their color and lemonade mixes on the table. The group on the right sold Starbucks lemonade. I strolled over to the next team and was greeted with two sturdy juice dispensers, one filled with regular lemonade and one filled with strawberry lemonade. The original option had lemon halves floating at the surface while the second option had full-sized strawberries at the top. The students proudly informed me that they were the only stand to offer fresh fruit in the product. Not only that, but the team made sure to grab the most strategic location on Prince Lawn, the area straight ahead from folks the moment they walk off of Wall Bridge. These students used fresh fruit and a strategic location to attract customers to their stand. I made the rounds to two more lemonade stands right next to each other. The first one offered regular lemonade but with a chance to get twice the amount. The group had a water pong table set up. If you purchased a glass you had the opportunity to take a shot. If you sunk the ping pong ball in a cup, you received a free glass of lemonade. The other group was selling blue raspberry lemonade. Although the clear blue liquid looked tempting in the milk jug, I think I liked the idea of teal lemonade from the previous class better. This first group on the left offered a chance to win an extra cup if you made a water pong shot. The group on the right had blue raspberry lemonade. The final two teams I visited also had unique twists. One of the groups had Gatorade coolers of lemonade and iced tea. Customers were invited to walk up and pour their own Arnold Palmers. The other group offered Capri Sun lemonade for those who wanted to travel back several years to enjoy the drink they received after completing one of their third grade soccer matches. One group had you help yourself to mix an Arnold Palmer while another group sold Capri Suns. For me, my choice for favorite lemonade stand was a no-brainer. I thought the group that accepted credit and debit cards blew away the competition. My second favorite idea was the stand that allowed customers to take their own bottled water and lemonade packet and mix it themselves. Of course the ultimate combination would be a cross between the best of the best from the first day of lemonade stands and the second day. 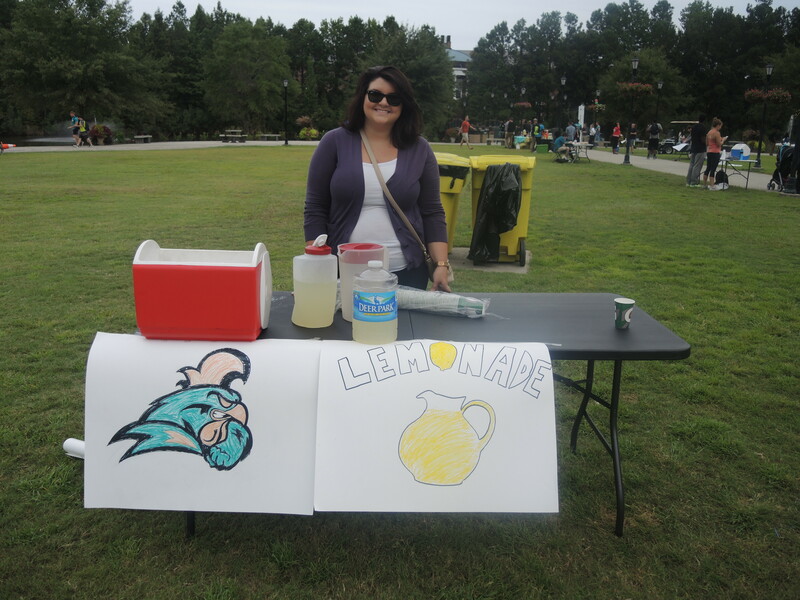 The group that sold TEAL lemonade would team up with the group that accepted cards to form a stand on Prince Lawn that would generate a line stretching miles. Needless to say, I would pull out my debit card and buy a cup. Don’t Blink. NOTE: Once again, Brent’s fiance, Sidney, takes over Don’t Blink for a Sunday. Enjoy today’s post where she gives us a glimpse at her profession. I love my job. I have known since I was 5 years old that I wanted to be a teacher. There has never been another career path on my horizon. But I’d be a fool if I thought that everyone in the world viewed my job in the same light as I do. I know very well that there are two common opinions of my profession. There are some who think I am a saint, and others who would be more apt to call me a glorified baby-sitter. In tonight’s post, I am asking all of you avid Don’t Blink readers to make the call. I’ll give you a rundown of a day in the life of Miss Mathis, and you can tell me what you think. Am I a Saint or am I a sitter? I get up at this time every morning. As of lately, I’ve been getting out of bed throwing on some Nike Free Runs and taking a brisk 2 mile walk around my neighborhood (even though I’m a teacher, I still have a wedding to look good for!!). After my walk, I hit the showers, wrestle my hair into an acceptable hair-do, paint my face with make-up, and don my professional attire. At this point it is pretty close to 5:45 am. I hop in my car and make the 15 minutes commute to school. I’m not required to be at school until 7 a.m. but if I did this I would feel rushed and unorganized starting off the school day. So I choose to get there an hour early and take my time preparing for the kids. Most of this hour is spent checking my emails, wiping down desks, and giving my lesson plans one last thorough look. Sometimes, I may dash down to the library and make a few copies or check out a new chapter book to read aloud to the kids. Brent and I in my classroom last year. It’s at this time that my friends who also teach grade 2 (I don’t call them collegues, because they are genuinely my three best friends) have made it to school. I take a few minutes to tell them good morning, chat for a couple minutes, and then it’s right back to work. I currently work in a Title 1 school. If you aren’t familiar, this means that a majority of the students at my school live at/below the poverty line. As a result, we have government funded programs to help aid students so that they can meet academic standards. One of the programs we participate in provides all children a free and nutritious breakfast, and it’s called Breakfast in the Classroom. This means that I get a laundry basket filled with individually packaged breakfasts and juice delivered to my classroom door every morning. I bring the basket in and then quickly fill out the paperwork and forms that accompany it. The bell rings at this time, and the children make their way to my classroom. I stand by my door and try my best to greet each kid. This might entail some hugs, high-fives, and handshakes. As I herd them into the room, I give the kids their breakfasts, urge them to eat quickly and quietly, and start on their morning work. While the kids eat and work, I start collecting notes from parents, transportation changes, answering questions, and occasionally I have to mop up spilled apple juice; all the while trying to mentally take attendance. At 7:35 a.m., my students and I watch the school’s news broadcast. We say the Pledge, observe a moment of silence, and pay close attention to special announcements. As the news commences I collect all the breakfast trash, change out the trash-bag in the trashcan, and put the breakfast trash outside my door to be collected. We review the morning work from that morning. I then give the kids a brief rundown of what we’ll be learning that day, and from here we dive right in!! I teach 2nd grade. It’s a very important grade, where students are slowly transitioning from “learning to read” to “reading to learn”. I teach my kids phonics (basic letter sounds and combinations) to help them progress towards becoming successful readers. I won’t get into the educational jargon of this process but it’s mostly me modeling good reading skills and strategies based on spelling patterns and letter sounds (I know what most of you are thinking…BLAH BLAH BLAH…but trust me. It’s a necessary skill). My students have special area class (i.e. Art, PE, Library) every day at this time. I take them to that day’s special class. This time is the time in the day where I am kid-free for about 50 minutes. Two days of the week I have this time to use as a planning period. The other 3 days of the week I meet with my 2nd grade team of teachers and our school’s curriculum coach to discuss the matters of instruction. This is also a time in the day where I get to USE THE BATHROOM—YAY!! I pick the kiddos up from specials and we make it back to our classroom. What we learn/study during this time varies. There is a complex formula and pacing guide I use to determine the material to teach during this time, but I won’t bore you with those details. Just know that at this point in the day I am teaching 1 of 5 things: science, social studies, grammar, writing, or handwriting. For those of you who care to know, tomorrow (Monday) I will be teaching the little angels about common and proper nouns. I know what you’re thinking…LUNCH AT 10 a.m.?!!?!? Yes. I know. It’s unbelievably early, but it’s not that bad. Some of you may be thinking that this is the time during my day where I sit and decompress and leisurely eat my meal with my friends. Wrong. Since dating Brent, I have heard of these mythical creatures called “Lunch Aides”. They don’t exist in South Carolina. I go to lunch with my students, send them through the service line, and sit with them as they eat. During this time, I will most likely open three snack packs, heat up 13 chicken nuggets in the microwave, and grant six precious souls permission to go to the bathroom. Oh, and I also take the time to pound back a SlimFast milk shake (back again to looking great for my wedding!!). At around 10:25 a.m., I get the kids to pick up their trash, dump their trays, wipe the tables, sweep the floor around their area, and line up. Then I corral the kiddos out to the playground for recess. (The mythical “Recess Aide” is also not present here in SC). For 25 minutes I supervise my students laughing, playing, running, jumping, and overall having a great time being kids. I love to watch them play. It can be quite entertaining! It’s 11 o’clock in my day, and I’ve already served two meals! I feel like a champion right now. I bring my kids down to the reading rug, and we have our most prized time of the day. Read Aloud. For about 15 minutes every day after recess, I take the time to read aloud from a chapter book to my babies. They love it. They live for these 15 minutes! Their only duty during this time is to sit and listen and enjoy a good book. Then we move straight into guided reading where we read a 2nd grade level text. I model the comprehension skills of good readers and as a class we dissect all different kinds of elements of a story. It’s fun stuff man!! This week we are going to put our brains to the test as we study the fable “The Lion and the Mouse”!!! My classroom is a differentiated classroom with all different ability levels. I have some students who rank in the 99th percentile for reading skills and others who rank in the 3rd. During the small group session, I pull together about five kids at a time (all of the kids perform at the same level) and they work with me in a small group (hence the name!). All the other kids in the class are working independently. Sometimes this can be a stressful part of the day, because I’m actively trying to work with five kids at a time while still monitoring 20 others students and assuring that everyone is on task and still engaged in meaningful work. It takes lots of practice and strict rules to get the kids to cooperate during small group. But four weeks into the school year, I am proud to announce that my little nuggets have finally mastered it! This is when I look at the clock and think…okay…we’ve almost made it guys. Don’t give up on me. We can make it! It’s a long day of learning and growing for my little 7 year olds and when I get to 1 p.m. my main goal is to keep them going and not let them get burned out. Math instruction in classrooms today is much like it was for all of us growing up. This week my kids and I are going to be diving into addition word problems and making a list of all the different strategies they can use to solve them! After Math instruction, my classroom finishes out the day by packing up. The kids will record their behavior code into their agendas and I will maniacally dart around and sign all of their agendas (I also try to write a positive comment in the agendas of at least three kids each day too). The kids collect their daily assignments, put them in their folders, shove everything in their backpacks, and line up for dismissal. I walk my children down the hallways to the bus loop and car-rider drop off. I give them hugs and kisses and tell them I love them, and wave goodbye as they head off towards home. After I’ve sent them on their way, I head back to my classroom to prep for the next day. Unless it’s a Monday…in which case I attend a staff meeting. Oh, and on Wednesdays, I contribute my services to the car-rider line. I walk the kids to their cars, help them inside, and send them off with their parents. But Tuesday, Thursday, and Friday…it’s back to the classroom for planning and prepping. 4:00 p.m. — Home again. Home again. Sometimes it’s a little later, but most days at 4 p.m., I turn off the lamps in Room 222 and lock my door. I walk out to my car and take a moment to sit. It feels good to sit after a long day. I make my way back to my house, and upon walking in my door, I collapse on the couch. As I lay there, my mind will slowly wander back to the classroom and I’ll mentally start mapping out the next day’s activities. So there you have it. 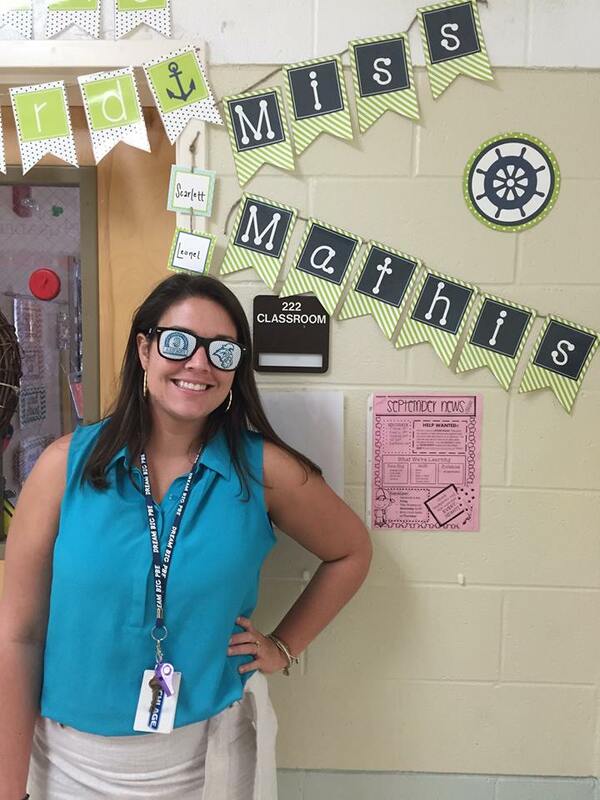 A day in the life of Miss Mathis. Some of it, I know, seems mundane. Boring to most. But if you live it, you love it. So now the time has come. You can decide. Saint or Sitter?? Sometimes I downplay my Thursday Rundowns. I would be lying if I said that my weekly blog post counting down five random topics always drums up a lot of excitement and relevance. However, I like tonight’s subjects. With that said, let’s get going. 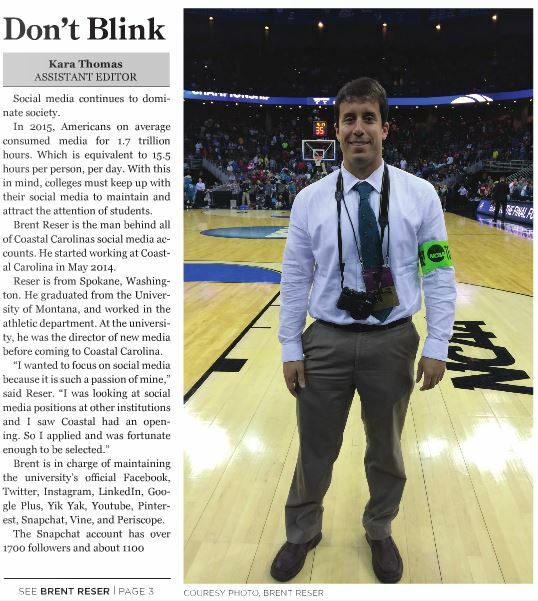 The Best Recognition – Last Thursday I shared with you an article that was written about me for the faculty/staff newsletter here at Coastal Carolina University. That was awesome and made me feel good but a different piece that came out yesterday really made me smile. I have a job primarily because of students so when that demographic is celebrating what I am doing it is the ultimate compliment. The student newspaper here, The Chanticleer, did a feature on me that made the front page. The fact that I was spotlighted in the student paper meant enough but the way the article was written just added even more icing on the cake. I think Kara Thomas did a fantastic job pretty much explaining me. To read the article, click here. I really enjoyed this article by Kara Thomas of The Chanticleer. Back to Mentoring – I had the opportunity to participate in a brand new program last year called CINO Legacy. 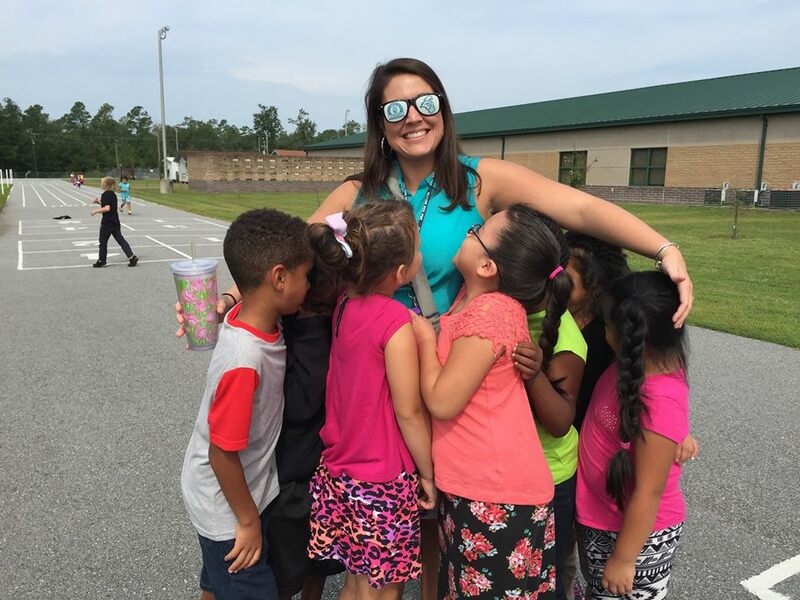 What this program did was pair a student at Coastal with a staff member at Coastal. 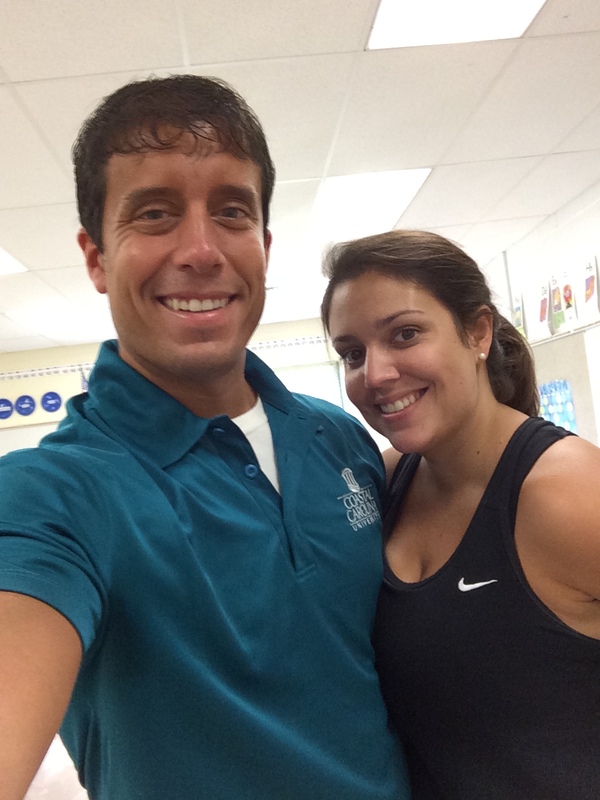 The student served as the mentee and the staff member served as the mentor. When I was asked to participate again this year I jumped right at the chance. This afternoon I had my first meeting with my mentee. Please meet Chelsea, a senior from Columbia, S.C., studying sport management. We sat down for the first time today on the outdoor porch at our campus Einstein Bros. As the time goes on we will discuss topics such as resume building, interview skills, and professional development. What a great program! I met with my mentee, Chelsea, for the first time today. Spot-A-Chant – Today I revisited my high school days and wore a football jersey to school…ummm…I mean work. 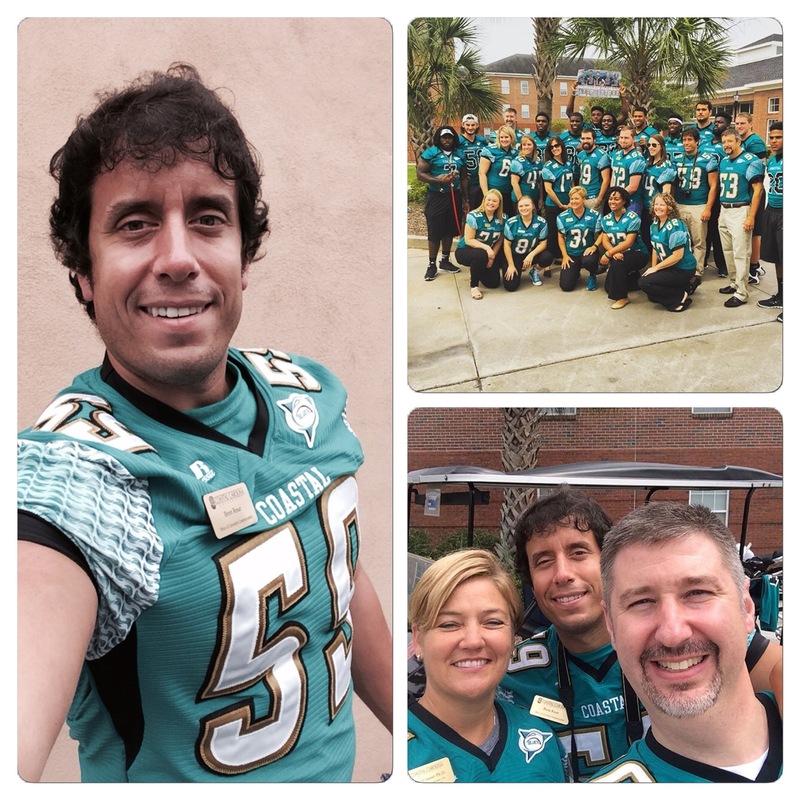 In a way to promote and build excitement for the first home #CCU football game, certain staff members were asked to wear old jerseys for the day. The wardrobe push also coincided with the main event of Spot-A-Chant. From 11:30 a.m. to 1 p.m., students could come to the front of our main dining hall and take selfies with the football players. Designed to allow our students to get to know our student-athletes better, the second annual Spot-A-Chant had a lot of our football athletes perfecting their selfie skills with members of our student body. Despite the lighthearted jabs that came my way because of the jersey on my back, I enjoyed wearing it! The photo in the upper right is an image of staff and football players. Can you spot me? The bottom photo is of our Vice President for Student Affairs Debbie Conner, myself, and our Food Service Director Jeff Stone. New Snapchat Filters – Those new Snapchat filters though. Man, Snapchat rolled out quite the update this week with brand new filters. They are colorful, scary, crazy, and kind of cool. They make for some pretty neat still images but the capabilities of utilizing them with video is the really rad part. I think Snapchat is doing what they can to get away from the reputation of offering grainy, low quality images. This new rollout is a step in the right direction. 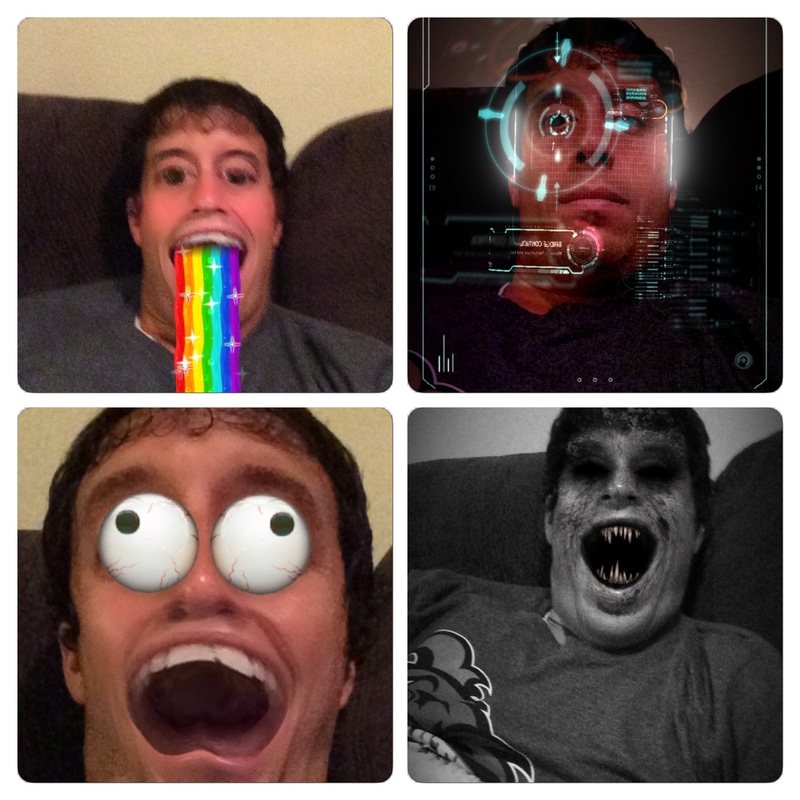 These are some of the new Snapchat filters. The Second Republican Debate – I thought “Big Brother” last night was entertaining…then I started to watch the Republican debate. I never knew debates could make me laugh and drop my jaw so much. CNN did all they could to sling all the mud they could across that stage. They definitely “outfoxed” Fox News when it came to pitting candidates against each other and starting drama. Not that I am complaining. Sidney and I sat on the couch just eating up the whole thing. If you tuned in to watch a traditional debate filled with policy, strategy, and civility you would have been very disappointed. 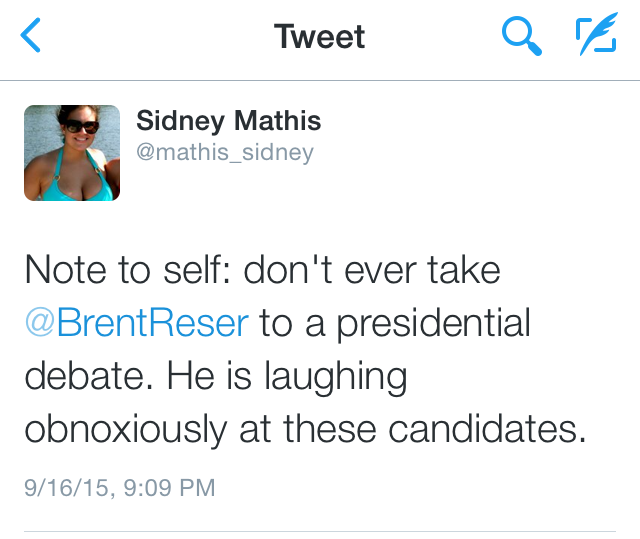 A tweet from Sidney regarding us watching the debate. That will wrap it up. I am excited to watch the Chanticleer football team take the teal turf on Saturday to open up the 2015 home season. It will be a great ending for what has been a crazy week for me. Don’t Blink.